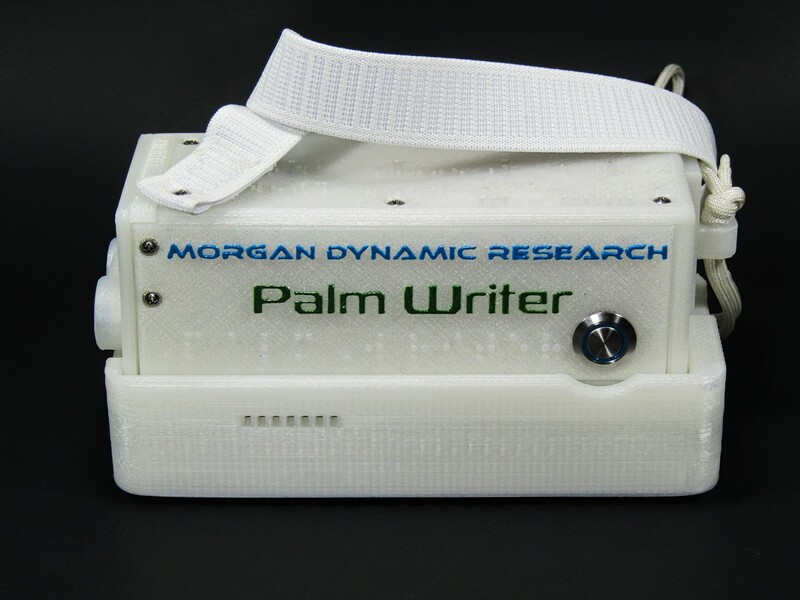 Morgan Dynamic Research proudly presents Palm Writer, a handheld navigation aid for the blind. In development since 2016, Palm Writer has reached the second generation of design and is more capable and comfortable than ever. We have incorporated the feedback from our blind testing base, whose assistance has been invaluable. Thank you all. For User Reviews Click Here. For User Guides and Instructional Materials Click Here. To Purchase a Palm Writer, Click Here. 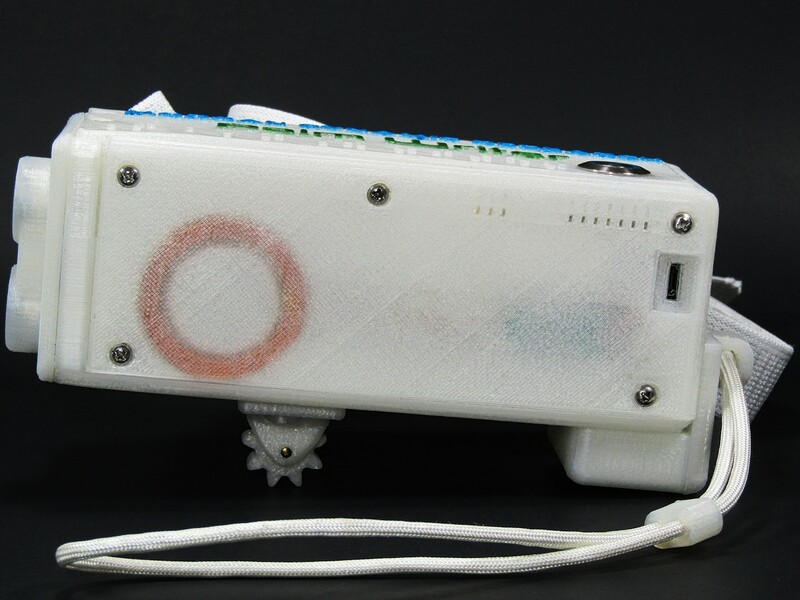 The Palm Writer is a handheld navigation assistant for the blind that detects the distance to what a user points it at and conveys that information to a user’s palm through a tactile feedback wheel. 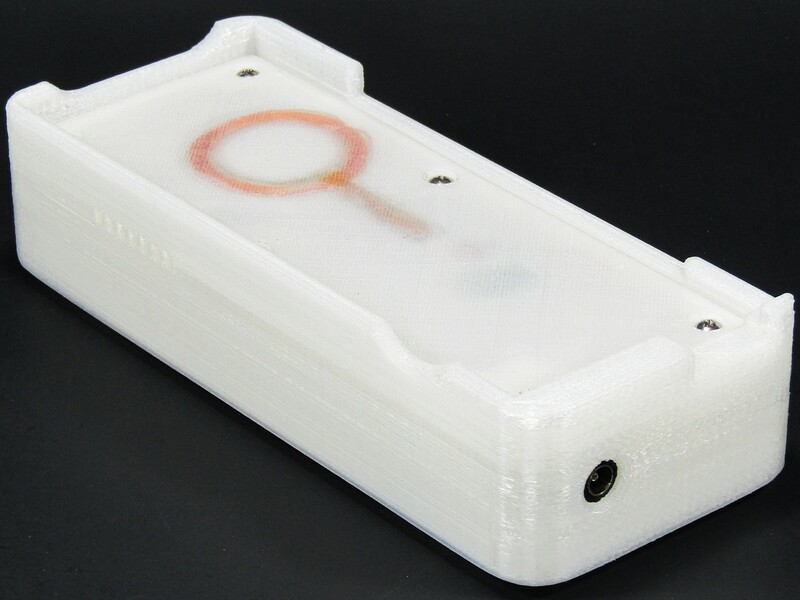 This is designed to provide a significant improvement to the quality of life of a blind user by allowing them to perceive the world around them in much greater detail. The silver circle shown is the power button. 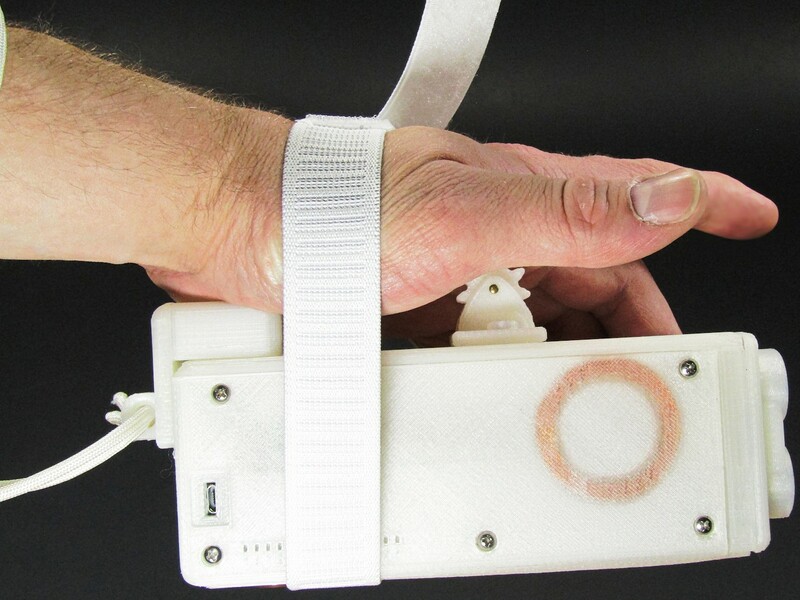 This unit is shown with the wrist strap and ergonomic grip kit. 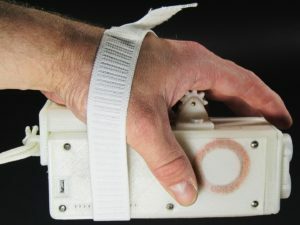 Shown here is the Palm Writer being held in a left hand grip with the aid of the Ergonomic Grip Kit. The Second Generation Palm Writer is fully ambidextrous. 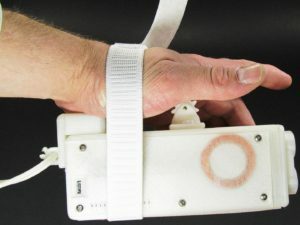 The Ergonomic Grip Kit, now a standard feature on all Second Generation Palm Writers consists of a Wrist Rest at the rear of the Palm Writer and an elastic and hook and loop strap that a user may flexibly wrap over the back of their hand and thereby relieve the strain of having to hold the Palm Writer. 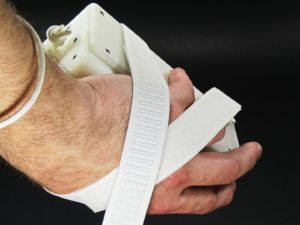 The strap effectively suspends the Palm Writer beneath the users hand via three points of contact allowing for maximum control and comfort during use as shown in the right hand grip position below. 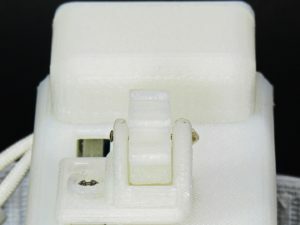 When the target you are pointing is close to the front of the Palm Writer the tactile feedback unit, is close to the front of the Palm Writer. The farther away the target you are pointing at, the closer the tactile feedback unit is to the back of the Palm Writer, or closer to a user’s wrist. The tactile feedback unit, or writer will represent nearer objects with greater movement, and thereby precision, than farther away objects. The writer represents detected ranges of up to 8 feet, or 2.44 meters, within the length of its slide. Also shown below is the micro USB charge port included on all Second Generation Palm Writers. The writer features a centered feedback wheel. 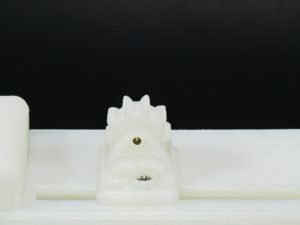 This feedback wheel is smooth toothed for maximum precision positional feedback. The Palm Writer updates the position of the tactile feedback unit about 8 times a second, allowing for effectively real-time scanning. The Palm Writer also features a flashing blue warning light on its front for increased visibility at night or in dark locations. 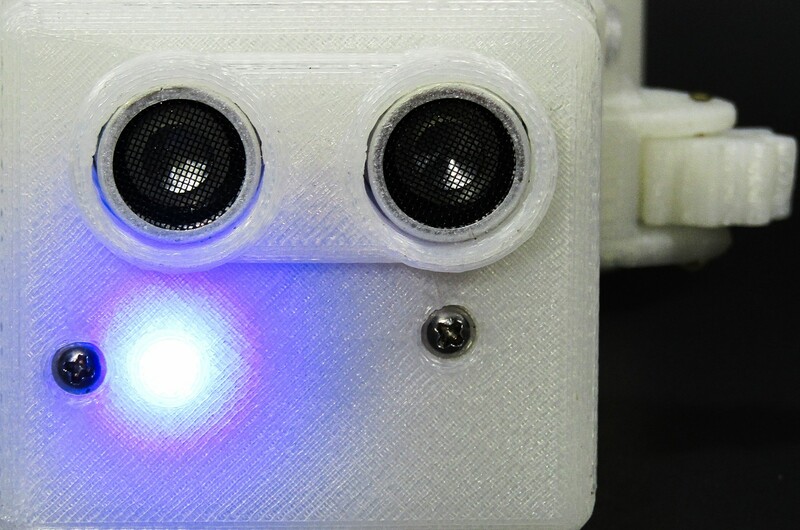 The two dark circles shown are the ultrasonic range finding unit. The Palm Writer is powered by a high capacity lithium polymer power cell that is charged by a wireless charging station. Depending on intensity of usage and user power off etiquette, a Palm Writer should last anywhere from 6 to 10 hours of continuous use on a single charge. The charging station is powered by a wall adapter that plugs into the back of the unit. Note the dark plug shown. The Second Generation Palm Writer includes a seating beep to indicate that a user has correctly placed a Palm Writer on the top deck and that charging has begun. Both the Palm Writer and its charging station have redundant protection features build in to ensure proper charging and long service life. Palm Writer offers a full auditory announcement system including a simple battery level indication, a homing beep system, and a no signal alert. 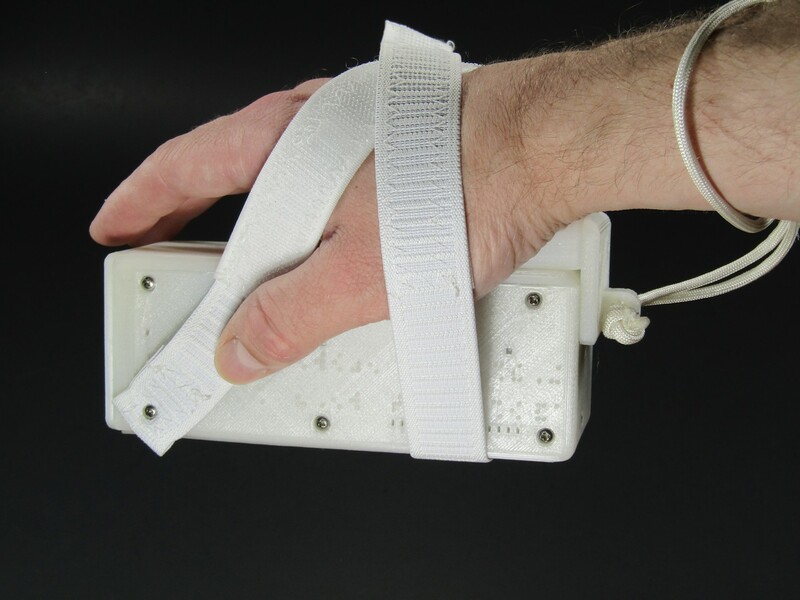 This technology was designed and refined with the blind to offer a maximum degree of usefulness. 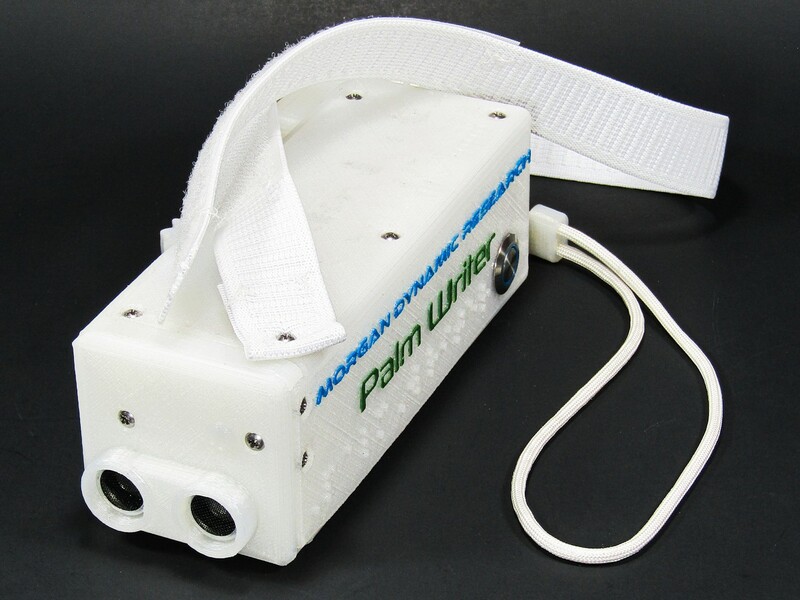 Palm Writer can be used without a navigation cane, but it is intended to be an assistive support device. With Palm Writer you can scan for people, pets, and fragile objects within 8 feet of you without the need for physical contact. Palm Writer particularly excels at scanning table tops for glasses, plates, and other objects. It can even detect a pen dropped on the floor. You can check where people are around you and even check for overhead obstructions such as tree branches. Palm Writer can even be used to see through glass or into fish tanks. Palm Writer is designed to grant a user the ability to perceive the world around in rich detail. With rugged hardware and firmware design Palm Writer is ready to help you take in a whole new world of input. Palm Writer offers a fast learning curve, but leaves much room for fine skill development that will only further its useful applications. Palm Writer is manufactured by Morgan Dynamic Research in the United States with only high quality components. 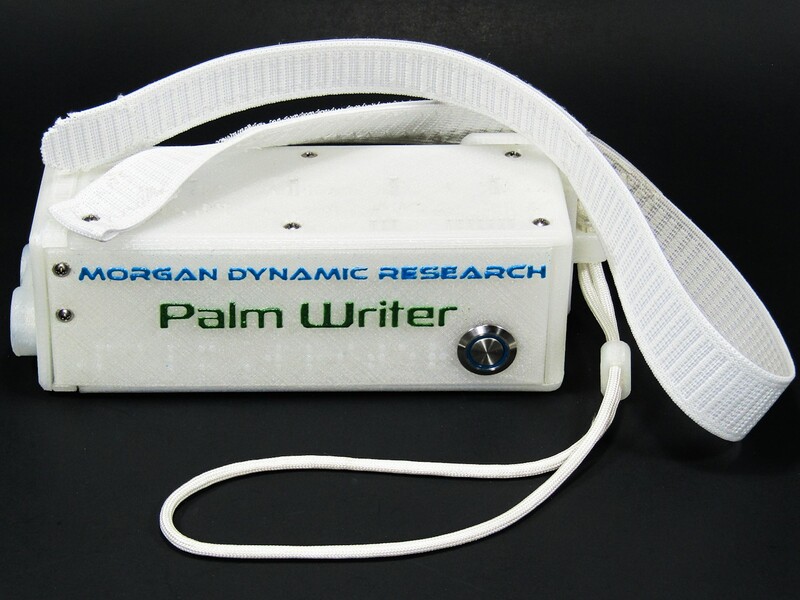 A Palm Writer with Ergonomic Grip Kit weighs 14.1 ounces (28.35 grams) or 0.88 pounds. 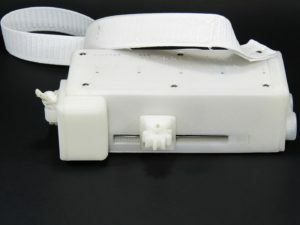 The Suspension Strap is 25 inches long and 1 inch wide. It is elastic with a wide hook and loop fastener to allow use with almost all hands. It is washable. Palm Writer is splash/lightly rain resistant, but cannot withstand any degree of submersion. 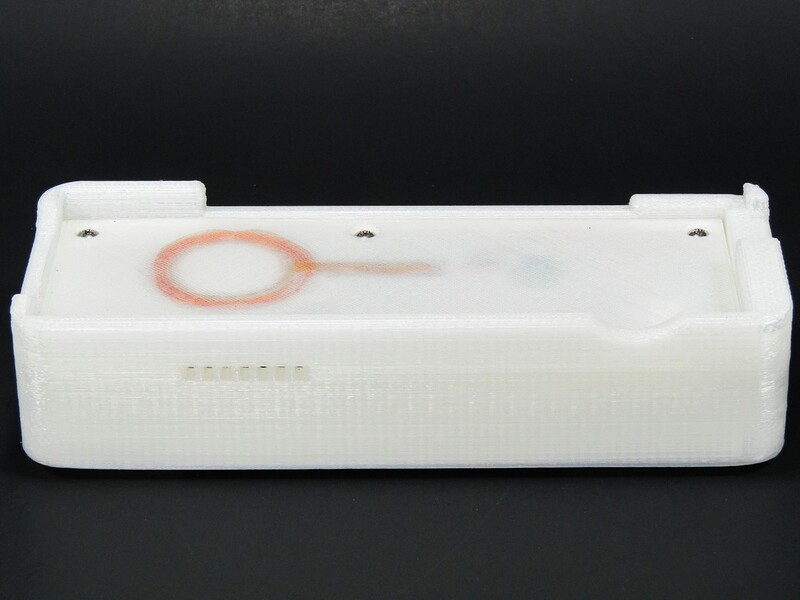 Palm Writer structure is made of 3D printed PLA plastic. Palm Writer Charging Station is powered by a 9 volt DC 650 milliamp wall power adapter with a 2.1 millimeter center positive power jack. The Charging Station supplies power to a Palm Writer wirelessly through a 2.5 watt inductive charging coil set. Charging Station dimensions: 1.5 inches high, 2.8 inches wide, and 7 inches long. A Palm Writer is roughly an elongated cube. This “brick” like shape exists for several reasons. The square profile allows the Palm Writer to be placed on a surface such as a table to scan for low objects. Additionally, the square shape is resistant to rolling and sliding off of many surfaces. Furthermore, the interior space of a square is greater than the interior space of a cylinder, and a Palm Writer is packed tightly with internal components. We can assure you that Palm Writer only is as large as necessary to achieve its performance. We have experimented with several other designs that do not use the elongated square profile, however, these alternate designs tend to suffer from various drawbacks including poor balance and weight distribution that resulted in overall worse ergonomics. The Second Generation Palm Writer includes the Ergonomic Grip Kit that eliminates much of the strain of holding a Palm Writer. © 2017 Morgan Dynamic Research, LLC All Rights Reserved. The “Morgan Dynamic Research” Name, Logo and “Advancing The Scientific Frontiers of Tomorrow” Slogan As Well As All Morgan Dynamic Research Product Names and Logos Are Trademarks of Morgan Dynamic Research, LLC.